Rabbit Facts - Yes, House Rabbits Do Growl. These rabbit facts will help you to understand your bunny better. Rabbits are quiet creatures. They usually do not make a sound. However, they have their own way of communicating and it’s through their body language. Here’s a list of rabbit facts so you be able to understand your house rabbit better. If you learn and know the way house rabbits communicate, then it will be easier for you to understand your rabbit. Did you know rabbits purr? They do when they are content. My Fu would lie on me and purr when I pet him. They can also growl when they feel threaten. Here are the meanings to some of the house rabbits communicating behaviors. Chin Rubbing – This is where your rabbit will go around and rub their chin on objects, marking their territory. They have scent glands located under their chin so they can leave their scent on things. This way when other rabbits wander into this area they will know it belongs to another rabbit. Your rabbit will also feel safe in their own territory. Male rabbits usually do chin rubbing. Ear Shaking – When your rabbit shakes their ears it means they are annoyed or something smells unpleasant to them. So if you are holding your rabbit and he shakes his ears, it’s his way of telling you he wants down. Flattening – When a stranger or another animal frightens your rabbit, he will crouch to the ground. His ears will be flattening to his body and his eyes wide with a look of terror. Assure your buddy that it’s ok and remove whatever is the cause of frightening him. Kicking – There are two types of kicking your rabbit may do. The first type is a ferocious kick if he is being held and he does not feel safe. He could be held in correctly and he wants to escape. Be careful, because your rabbit will try to jump out of your embrace. If this happens, he may hurt himself. The second is a joyful kick when he is out playing and running around. A word of caution. Since rabbits have powerful hind legs you must be careful to make sure they do not hurt themselves. Their backs are very sensitive and if held incorrectly or if they kick incorrectly, they can break their backs. Licking – This is a sign of affection. If your rabbit licks you, then he thinks you are his buddy. My Fu would lick me, he was showing me how much he liked me. Thumping – When rabbits thump their hind legs it’s a warning sign. They are telling you and other rabbits danger is near. Take a look to see if there is animals near by then reassure your rabbit that he is ok. Lying Down – When your rabbit is comfortable and / or sleeping he will lay on his side with his feet stretched out in front of him. The first time I saw this I thought my little guy was dead. He wasn’t, he was just sound asleep. He may also lay on his belly with his hind legs stretched out behind him. If you see your rabbit lying like this you will know he is very comfortable and content. Sounds – Your rabbit will make sounds to communicate with you and other rabbits. When they Hiss or Growl, it’s an aggressive feeling. It’s a warning to back off! My Oreo growled at me once when I was picking up a hay chew of his. He was telling me that I better back off, that the chew was his. I left the chew alone and everything was fine. Purring – Will let you know your rabbit is content. It’s not like a cat’s purring their teeth chattering make a rabbit’s purring. Teeth Grinding – Soft teeth grinding is a sign of a happy content rabbit. Loud teeth grinding is a sign that your rabbit is in pain. Screaming is when a rabbit is very frightened and is being attached by a predator. If your rabbit screams it’s a bone chilling scream. I have heard wild rabbits scream and it is not a pleasant sound. Sitting Up – When your rabbit sits up on his hind legs he is checking out his surroundings. He wants to make sure there is no trouble around. His ears, nose and eyes are scanning the area looking, listening and smelling for trouble. Spraying – Males that have not been neutered will spray urine to mark their territory. So they will go around and spray areas that they think are theirs. That is why I had all my boys neutered. These rabbit facts will help you to understand your rabbit better so you will feel at ease around him. Rabbits react better to people who are relaxed, than to people who are nervous. They can tell when someone is feeling tensed. 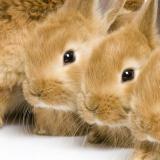 So I hope these rabbit facts will help you to enjoy your pet rabbit. They are, as I feel, a wonderful pet.